Amazon(S AMZN) who? 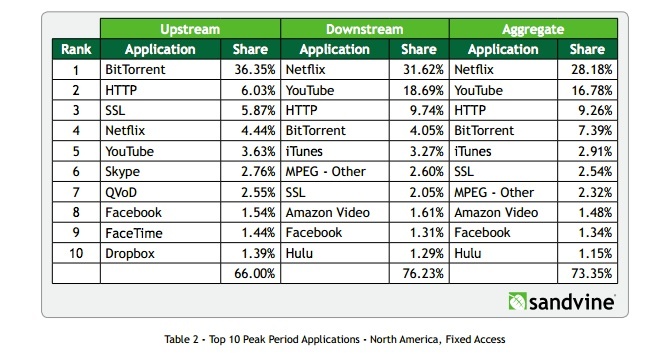 Netflix (S NFLX) and YouTube (S GOOG) continue to be the most-used video services in North America by a wide margin, according to Sandvine’s newest Global Internet Phenomena Report. 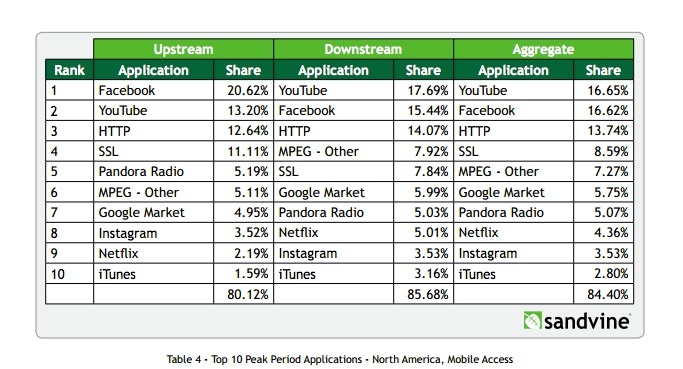 The report shows that video streams from the two services together made up more than half of all peak residential North American downstream traffic in the month of September, while Hulu and Amazon together just account for three percent of all peak downstream traffic during the same time period. 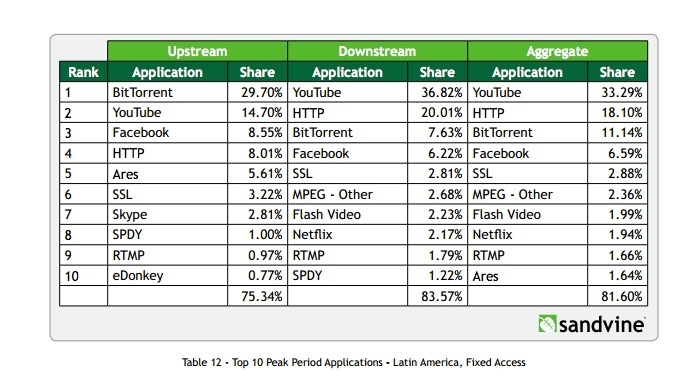 Leading the charge was Netflix with 31.62 percent of all peak downstream traffic, while YouTube was responsible for 18.69 percent of all peak downstream traffic. Amazon video, which consists of both VOD and Prime subscription streams, was responsible for just 1.61 percent of all peak downstream traffic, and Hulu came in at just 1.29 percent. YouTube saw its traffic grow by 9 percent when compared to Sandvine’s previous report, something that the traffic management company attributes to the growth in device and in-home, Wi-Fi-based mobile viewing. YouTube also continues to be the king of out-of-home mobile viewing. The service was responsible for 17.69 percent of all mobile downstream traffic in the U.S.
An interesting detail of this edition of Sandvine’s report is that it for the first time registered Netflix as a small but notable source of traffic in Europe. 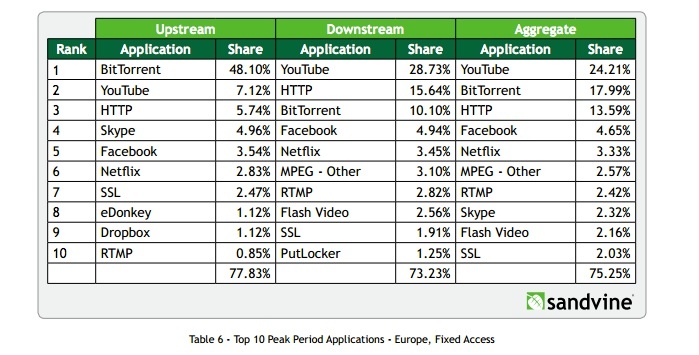 The service is now responsible for 3.45 percent of all peak downstream traffic in Europe, despite the fact that Netflix still isn’t available in some of Europe’s largest markets, including Germany and France. Netflix launched in the U.K. and Ireland in January of 2012, then expanded to the Nordics in late 2012 and just opened up shop in the Netherlands in September. Netflix also shows up in traffic data for Latin America, but is only responsible for 2.17 percent of all peak downstream traffic across that continent, despite being present in close to every country since 2011. And the company seems to see very little usage growth in the region: Six months ago, it was already responsible for 1.92 percent of all peak downstream traffic in Latin America. Hulu has way too many commercial breaks. Speaking of commercials, if the purpose of a commercial is to sell something its repeated frequent interruptions and length does nothing but irritate viewers. I tried to watch Blacklist on my NBC app and could not finish it because of numerous commercial interruptions. I think there were five or six breaks in content ranging from 106 seconds to 121 seconds in length. I quit watching BBC America because of this and really cut back on MLB. I watch NetFlix via my Apple TV device and forego most network and cable programming. Hulu is also unwatchable. @Guillaume, I agreed partially with Janko. You are counting domestic and international figures and dismissing the meaning of 100% today vs 2011. In my opinion the 3X factor you mentioned is more like 2.4X, still very, very impressive figure and more when the video quality of Netflix improved a lot in the past couple of years. But you are right, Netflix needs another eyeIO kind of technology ASAP to surpass HBOâ€™s number of users before H.265 can effectively replace H.264. In 2011 they were transmitting 1.5 billion hours of video per quarter using 30% of the bandwidth. Today after deploying eyeIO video technology they are delivering 4.5 Billion hours of video using 31.6%. This means a 3X factor in 2 years. WOW! While they managed to deliver 3X the amount of video using the same bandwidth, they double the number of users. Very impressive too! The big question is: They state that they want to surpass the number of HBO users (110+ M) this means that they need another eyeIOâ€™s technology as soon is possible or they will not be able to deliver and sustain their business. I know that in 2011 eyeIO-H.264 offered in advance the benefits of H.265 and is now very clear that they did it. But Iâ€™m wondering now if eyeIO have something new in H.264 that can compress even more of what they did in 2011. Or Iâ€™m wondering if they will be able to apply their technology to H.265. Although I donâ€™t believe this path is even realistic as there is not time to switch all Netflix library to H.265 and more importantly switch ALL their devices to support H.265 playback. Wow what a dilemma! I guess that the plan C will be to cut anything above 720p and got back to the old â€œNetflix qualityâ€ they used to have when they faced a similar problem in 2011. Guillaume, I think you are jumping to the wrong conclusions. Overall bandwidth consumption is growing – 30% of all residential downstream traffic in 2011 was far less in total terms than 31.6% in 2013. @Guillaume. Late 2011, I asked to Netflix if the Sandvine metrics were acurate and they told me that more than 33% the real number was around 25%~28%. (Netflix didnâ€™t know how Sandvine got the numbers they published). But agreed Netflix is going to need an new eyeIO like technology to compress more in H.264. (I heard that they can do now 720p at very low bitrate now). With regards H.265, I heard in a conference that eyeIO have H.265 and they are able to compress 18% more of what they have in H.264 second generation. But I have to agreed; it is going to take years before Netflix can migrate everything to H.265. Per example I know that Netflix still needs to deploy VC1 because of this legacy issues and that they will be happy to send to their customers some Roku boxes to avoid the VC1 codec. On your plan C idea. I also noticed since a coupe of months that the quality of some videos has been degraded. I noticed too that several platforms are capped to 1.7Mbps while other at 720p (3Mbps). So it is obvious that Netflix is under pressure again. The one content space I dont go to either of these two is the great Amazon VOD service as part of Prime. I think until VOD is ubiquitous on Netflix, Amazon will make inroads. I love paying $6 for an in the theater HD stream straight to my high def monitor. It is possible that Netflix is responsible for portion of SSL traffic, as people use VPN tunnels to get Netflix shows that are not available in their regions. Amazon has a huge gap in their offering…Android. To expect someone to purchase a dedicated Android device (Fire) just to watch their content is dumb, dumb, dumb. ??? I don’t follow what you mean. I’m a Prime subscriber, and I watch Amazon video almost exclusively on a Vizio tv w/Amazon player built in. Is there some content of Amazon’s that requires a Fire to watch? In think Madlyb means to say that Amazon doesn’t have a video app on Google Play.